One of the advantages of going back to a form of making I haven’t used much and I am not comfortable with gives me fresh insights into the making process, for me hand building is something I never really pushed on with like I did with throwing. 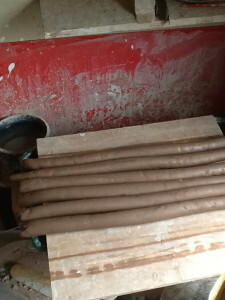 Each part of the hand building process has its own rhythm; it doesn’t matter how fast or slow. What is more important keeping a steady rhythm, rhythm improves the flow of making, in fact trying to go fast and misplacing hands can cause the mind to pause and wonder what it is you were trying to do. To keep this sense of rhythm I tend to repeat the same process over and over doing all the weighing, then wedging, then rolling out the coils. These first sections are really easy to build a nice pattern and flow to the making, but these easily coils are only a means to an end. 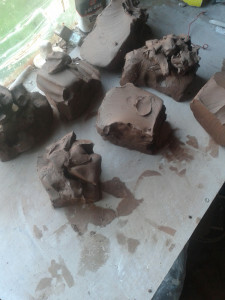 Joining the layers of clay together with a knuckle takes a lot more practice to settle into a rhythm; at first there are a lot of stops, and starts, there much to learn. Learning to regulate finger pressure just right, to remove the thickness of the walls and evening out the lumps takes time. There is a lot to think about at first but with practise and time it happens almost instinctively and is impossible to truly describe the movements. The hardest thing by far though, is learning how to paddle the clay. The tools I use are not traditional shapes and are just bits objects I have made myself. The paddling section I have decided to remove from the process I intend to teach, and instead use slabs with the coils and a mould of some form to create something different to a normal first lesson. The first lesson I used to teach was always a pinch pot with a coils added, over time for children this turned into monster making where the pot opening became the mouth, the coils became teeth, arms, eyes. It really engaged children as it was something they could be really creative with rather than just a bowl. The rhythm needed for throwing is so very different, for beginners it is very unforgiving. It all relates to the speed of the wheel and moving in time with it. It is a lot to take in alongside finger pressures and having to move the fingers up slightly after a single rotation of the wheel. I question sometimes with musicians would find it easier to take up as they work in rhythm and generally most instruments do different things at the same time. 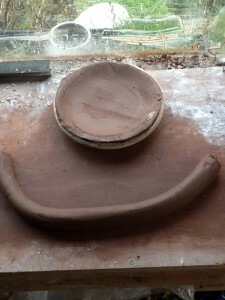 With my own making practise there is rhythm to other parts of making too; slips don’t go on the same day as throwing. They have to wait and dry, drying times depend on seasons and whether the piece was thrown or hand built die to moisture content. 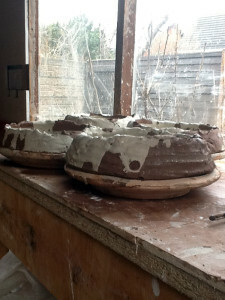 A kiln tends to be filled to overflowing so I can select my favourites and with the bisque firing things are stacked close and touching. One bisque kiln becomes two glaze kilns, and my love of working on one process at a time continues, so all pieces are painted with oxides and then the surface glazed. The kiln is packed with as little space in as possible. Watching kick wheels like Simon Leach’s treadle wheel there is a real different in rhythm and speed. There is that real sense of rhythm as the potter kicks again and again at a steady pace. The pot slowly grows and forms with this constant kick. A momentum wheel fascinates me as the wheel is kicked up to a fast pace and then the throwing process continues as the wheel slows naturally and the potter has to adapt to this changing rhythm. 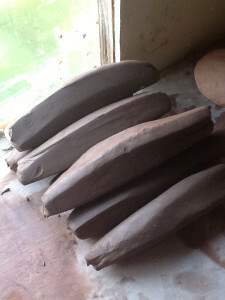 The Potter doesn’t really kick as they are manipulating the clay as this would change the nature of the touch. Doing this research project has allowed me to step back from my set making processes, and allowed me time to think about my own rhythm when I make. It has given me the time to experiment with hand building again and also to focus on parts of the making that I didn’t do when I was running my business. Running my own business I started trying to settle into the rhythm of production making without ever doing the experimentation to find what forms I like. My new slower rhythm helps my creative voice come through more than it did before. In the future I definitely want to continue playing with my rhythm to see if that can change the nature of the object. This entry was posted in Making, Research and tagged ceramics, clay, coils, hand building, hands on thinking, making, terracotta, touching. Bookmark the permalink.